Gimmelwald Switzerland is one of my favorite places in the world. I bought this postcard while visiting in 2002. 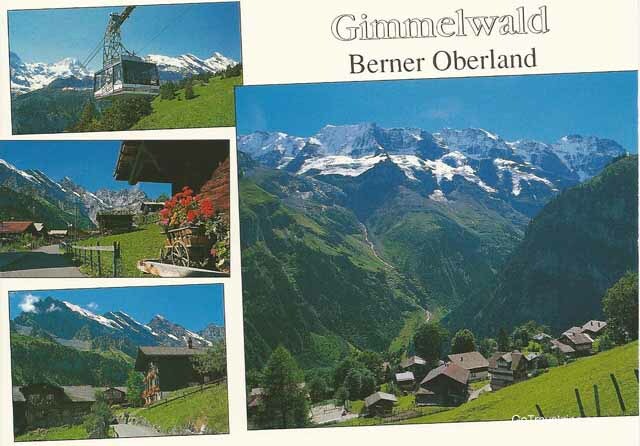 Gimmelwald is a small village located in the Bernese Oberland area of Switzerland. There are about 130 residents of this village and most of them are farmers. In order to get up to the town you have to take a Cable Car from the valley below. It is one of the most beautiful places I have ever been and hope to return for another visit someday.